Methyl ethyl ketone (also known as MEK or 2-butanone) is a powerful, commercially important industrial solvent for many substances, especially resinous materials and has a wide variety of applications, including use in solvent-based adhesives, polyurethane slurry for synthetic leather, paints and coatings, printing inks, and magnetic tapes, as well as use as a dewaxing agent during the refining of lube oils, a degreaser for metal surfaces and electronic devices, and a raw material for manufacturing methyl ethyl ketone oxime. The MEK market is fairly concentrated, with the top 10 world producers accounting for nearly 80% of global capacity in 2018. The three largest global suppliers of MEK are China, Japan, and Western Europe, accounting for nearly 85% of the total global capacity as of mid-2018. The United States ceased production of MEK in 2013, but at one time had been the major global producer. The US market is now supplied entirely through imports. 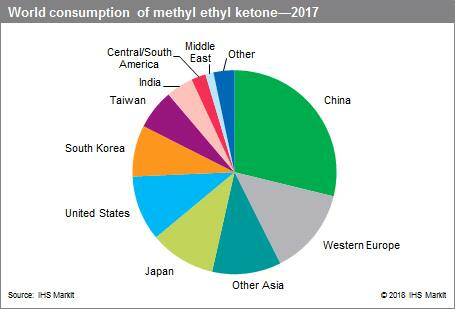 In 2018, Asia is expected to account for nearly 70% of the total world consumption of MEK. Paints and coatings continue to consume the majority of MEK, and little change in the world MEK market breakdown is expected by 2023. Adhesives make up the second-largest share of the MEK market in 2018, and represent the largest and fastest-growing market in China, where consumption is largely for the manufacture of shoes. Western European MEK demand has been impacted by increased use of recycling and process optimization. There has been widespread interest in reformulating to replace or reduce MEK usage, especially in times of supply shortages or high prices. Only slight growth in MEK consumption is expected in Japan, but the country will continue to be a significant supplier to the export market. MEK consumption in Other Asia (excluding Japan and China) is expected to increase at an average rate of about 3% per year during 2018–23, led by growth in India. MEK consumption in the developed regions will increase only modestly during the forecast period. The slower world consumption growth (compared with previous years) reflects a slowing global economy, competition from other solvents, and technology substitution in the coatings market, as powder and waterborne technologies are growing at the expense of their solvent-based counterparts. World MEK consumption is forecast to grow at an average annual rate of less than 2% during 2018–23. Most of the growth will come from Asia Pacific, especially China, where its use in four major applications (footwear adhesives, artificial leather, methyl ethyl ketone oxime production, and electronic device cleaning) is expected to grow at about 2–3% per year during 2018–23. MEK prices are strongly influenced by the price of crude oil, as well as the balance in supply and demand, which can lead to extreme price volatility, especially in times of unexpected global outages.